6 January 2016 - The hoops are in and the WINTER WARMER is ON! It took all day, but the hoops are in on courts 1 & 2, and on-time for the start of our winters season play. Play will be with against closely matched opponents. Sorry for the short notice but heavy overnight rain and the river rising overnight has left the courts unplayable today. Having spent all day yesterday putting the hoops in, this is of course disappointing but play is always conditions dependent. ~ The Winter Warmer ~ is POSTPONED and there will be more news on his is due course. There was resigned disapointment today when our 'Winter Warmer' event was defeated by overnight rain and a risen river whch rendered our courts unplayable. Hopefully play will be possible from tomorrow moring onwards. We have a system in place now where head gardener Matt tells me each morning before 0930 if there is to be 'No play'. I will then update the website accordingly. The default is that the courts are open unless the website says otherwise - however, please bare in mind that conditions can and do change during the day. Our courts have been waterlogged for much of the last two weeks but when play has been possible, a few keen members have managed to get in a game or two. So, we will start the 'Winter GC competition' tomorrow (Monday) - It's only for fun and is a piece of cake to participate in. Winner gets an excellent croquet tactics book! Greetings from South Africa where Frances and I (Chris) will be playing in the Southern Cape AC Championships for eight days from Saturday. Today (Thursday) is a first 'warm-up' day, like we really need that - crickey it's hot here! Before we left, the main GC mailings, that set up the season ahead, were sent out (all six of them!). Thank you to all those who responded with kind words of appreciation. The response has been very good thus far, with indications of entries to season long competition coming along and expressions of interest in playing in the 'local friendly teams' also particularly encouraging. Our winter play continues to be dogged by the occasional days when the courts are closed due to waterlogging, thus is our lot with our riverside location being particularly vulnerable to the rising water table. Nevertheless, a few hardy souls venture out frequently, all wrapped up warm, and Roger Goldring continues to brave it out in his shorts! Roger leads the way in the winter competition and could do with some challengers, so please do record your singles results on the notice board and join in - it's only a bit of fun! Our events callendar for the season ahead is well on the way to being completed. All the GC and AC Tournaments have now got fixed dates. GC team league matches are starting to be arranged and should be completed by early February. GC freiendly and AC team league matches will also follow in due course. 23 February 2016 - Spring Drinks / Fork Supper - (15 March) - book now! Booking for our Fork supper on Tuesday, March 15th opens on Wednesday, February 24th. This will take place in the Finlay Suite and the cost is £13.95, Dress casual. A complimentary drink will be served on arrival at 6.00pm and food is at 6.30pm. More details can be found on our notice board from Tuesday 23rd February onwards. Chris Roberts and Frances Colman have just returned from their annual croquet trip to South Africa where amongst other friends they met up with Phyllis Court members Carole Jackson and David Hopkins, who have a home there. The Somerset West CC (about 45 minutes east of Cape Town) was the venue again for the week-long Southern Cape AC Championships where despite having mixed results this time, Roberts and Colman enjoyed themselves very much. Colman was delighted that her right hand which had recently undergone surgery, held up much better than expected and with the aid of a padded cycling glove, she won through to the semi-finals of the handicap event, won again a game in her class and a further one in the handicap doubles with Roberts. For Roberts, that was as good as it got. 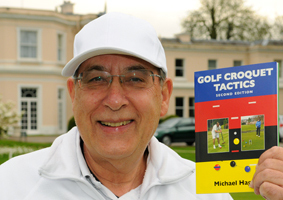 He found the opposition in the top class way to good, lost all his games and saw his handicap rise to 1.5 as a result. 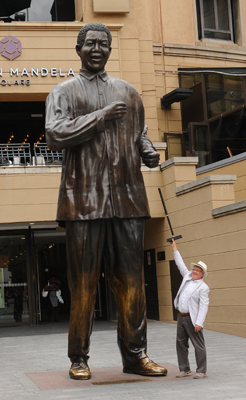 As the photo shows, a return journey via Johannesburg, allowed a visit to Mandela Square in order to ask (the statue of) the great man for a game of croquet! It looks to us like he would naturally play with a Solomon grip! The old adage that 'practice makes perfect' was well proven today by Roger Goldring, who scored well at this month's Hamptworth Winter Handicap and took his handicap down to a new low. The reduction down to the 2 mark, is a great achievement for Roger, who's development shows no sign of arrest. It is however somewhat bitter-sweet in its timing, just days before several B-Level tournaments around the country make their allocations. Roger is now ineligible for that Series of tournaments and will now have to look to replacing those in his diary with the more challenging unrestricted events in the National A-Level and top Championship Series. Congratulations on your achievement Roger! We are sorry to inform you of the sad death of Bill Eades, Pat’s husband, in the early hours of this morning. 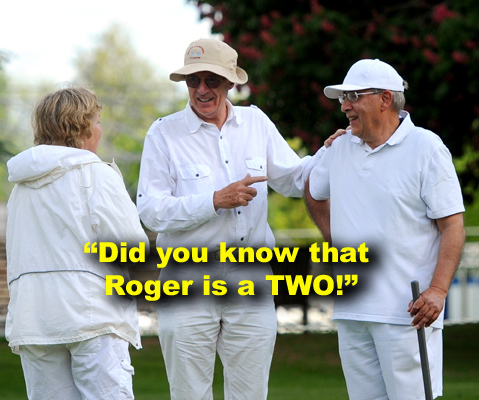 Bill and his wife Pat joined The Phyllis Court Club about 22 years ago and took up croquet the following summer. After learning Association during the first year they changed to golf croquet which proved to be Bill’s game. He served on the committee for many years usually in charge of lawns and equipment; he was also keen to enter competitions and was frequently chosen for matches. T.Johansen (which was a first for PCC). He enjoyed training newcomers and passing on his skills and his final tournament was partnering Pat in the inaugural Hugh's Mallet Tournament. Unfortunately his ill health did not allow him to continue playing, but for a few years he continued to come down to the club to watch and encourage others. On Thursday, 7 April, at 1.00 pm. - Bix Church followed by internment at the Fairmile Cemetery (family only – but should you wish to attend, you may). Afterwards at Phyllis Court Club.